Welcome! This is the story of how our family grew from two people who love each other to a family of nine, in a few short years! Michael and I were first blessed with our oldest son, Conner! For a long time, it was just the 3 of us taking on our adventurous life! However, we always knew we wanted to add another baby to our family – and became pregnant with our daughter, Allyannah, in 2011. Sadly, we lost her to Turner’s Syndrome and other heart defects, just before 24 weeks gestation. The loss devastated everybody in our little family. After a long time of grieving, we decided to try again to have a baby. But after years of trying, we were diagnosed with secondary infertility with no known cause. This was so frustrating! We wanted to know what was wrong so the doctors could fix it. It was a whole new world for us. We had our first IUI in November 2013, and daily ultrasounds showed we would be lucky to have one baby, and not to expect anything from it. Did they miss something or what?!? We went to our first and second ultrasound after the IUI and found out it was twins! We felt so blessed! Two days after Christmas, on our third ultrasound – I was so grateful Michael could get off work to see the heartbeat ultrasound, since he had to miss the previous two ultrasounds – on the screen, popped up five strong heartbeats! That one little moment changed our lives forever in every single way! We welcomed America’s First Surviving Military Quintuplets in June of 2014. 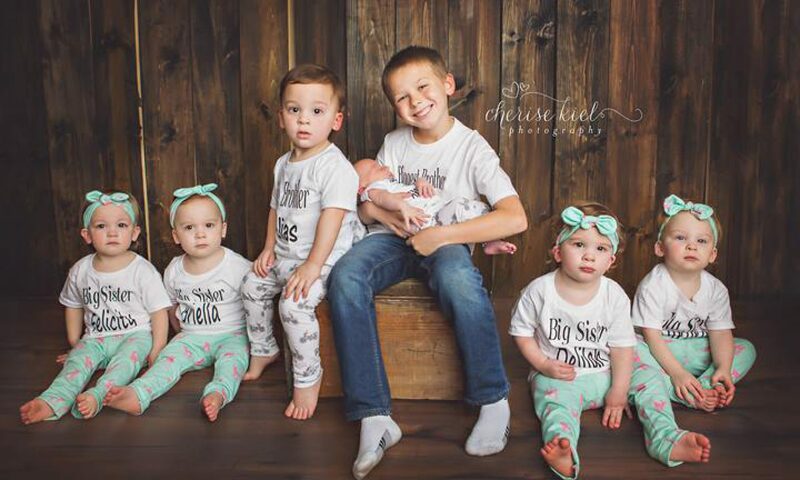 We thought our family was totally complete after these little miracles! Little did we know God had a bigger purpose for us! In June of 2015, we found out we were spontaneously pregnant with another baby, Gideon! He beat so many odds to get here and completes our family perfectly! Yes, that is right! We had 6 babies in 20 months, in addition to a wonderful big brother. 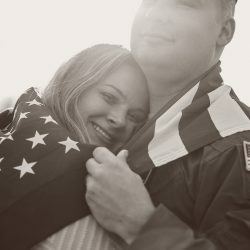 We have all the same struggles and joys other multiples-family have, but with an added twist of the military lifestyle. Moves, deployments, being away from family/friends, training, and more, are just part of our everyday lives. It isn’t easy, but we make it work. We’d love to keep in touch with you! Follow us on Facebook for regular family updates, or follow our Youtube Vlog. We promise to keep you entertained, and to offer some inspiration if you are also suffering from infertility, or the loss of a child. Over the years, we’ve received a lot of queries from moms struggling with everyday parenting struggles, as well as the bigger obstacles of infertility, loss, and grief. As a result, Roxanna is now opening up a direct line of communication for mothers who would like advice, or just a listening ear. Please contact us for details on how to schedule a coaching session. Thank you for reading about our journey, your support, prayers, and being a part of our “village”, since it totally takes one with this many blessings!